You most often come across the term “life line” in knitting when you are working on a lace shawl or similar but it is a technique that can help you in all sorts of knitted projects. A life line is a simple but very handy tool in your knitting life. 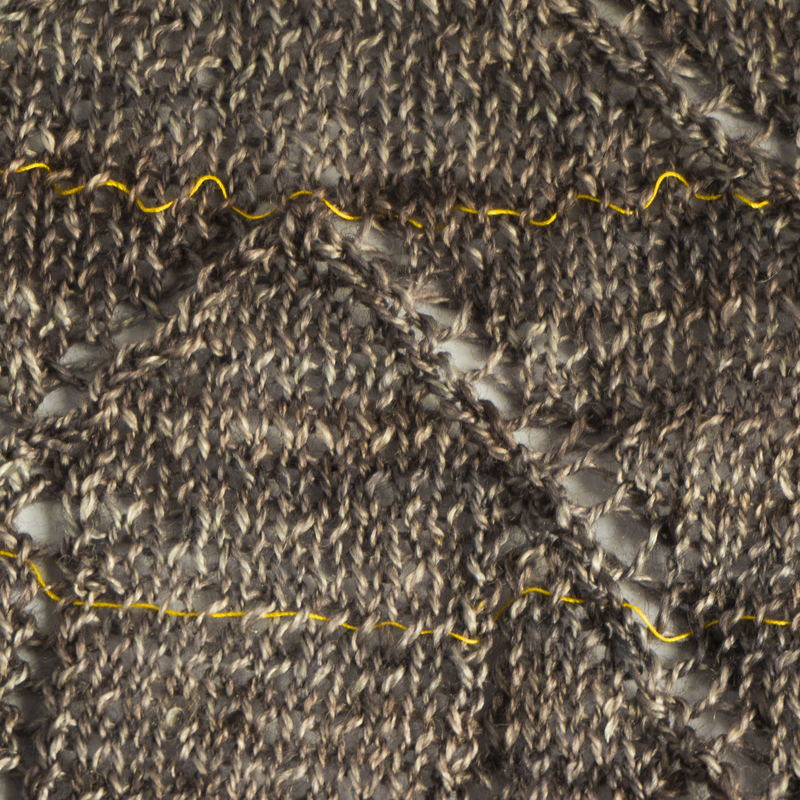 It is an additional line of thread/yarn that stops your work unravelling beyond a particular row. Thread a blunt sewing needle with sewing cotton or dental floss (or a fine yarn that won’t stick to your knitting or be mistaken for part of it) and then thread it through each stitch without taking the stitches off the needle. If you are using stitch markers, make sure that you DO NOT thread your life line through them. Leave a good length of cotton at each end so you don’t accidentally pull it out as you work. The cotton will stop your work unravelling beyond a certain row. You should put one in a point where you know your work is correct but where you are concerned that a stitch pattern or some shaping is complicated and may go wrong. If you do have a mistake and have to rip back, you will only go back as far as the row you know is right – make sure you have a note of which row that is. There are two life lines in this piece. 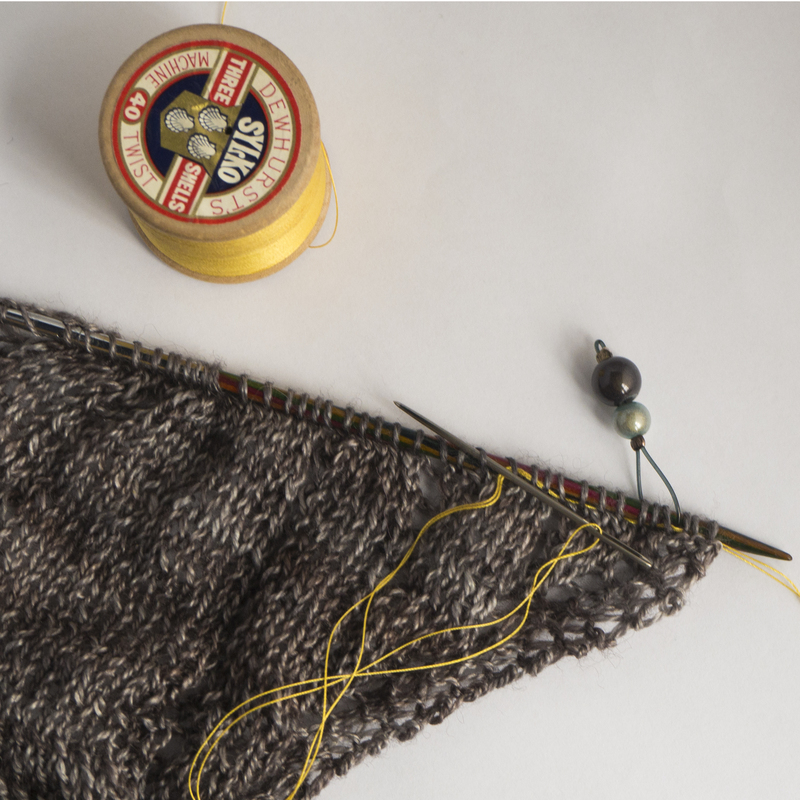 Life lines can be used in lace, colour work, cables or any other knitting and you can use more than one in the same project – on the last row of every repeat of a complicated lace pattern for example. Putting one takes moments but could save you a lot of time. If you are at all worried about making a mistake, even in something plain, think about adding a life line at a point when you know your knitting is right, it will reduce knitting stress.